These events unfolded in such a ridiculous way, my life is on hold until I can explain them. I looked for a guide to help me during this time and did not find one. This is not a typical blog post for me. Perhaps this can serve for someone in the future. The customer service end of my online business is probably the most challenging. It can sometimes take up to 20 minutes to craft the proper response to a customer inquiry or complaint. It needs to be concise, very brief and to the point. Easier stated than crafted. The beginning of this sounds like the segue for a joke: we just paid off our car a couple of days before and it wouldn’t start. It would start again if we left it alone for a few hours, sometimes overnight. I was convinced through my Googling that it had something to do with the car’s anti-theft system or electronic keys. As it was, the car couldn’t be trusted and, if it started, needed to be left on wherever it went – less than ideal. Since it was likely a security issue, it would need to be taken to the dealer. The dealer always means big bucks. We milked it until it stopped for good on Christmas Eve 2009. Everything we were supposed to attend, forget it. We didn’t even have food in the house. The only thing there was to do was tweet. In my tweets, I did not want to bring others down, so barely mentioned my situation. We had to wait until Christmas was over to get the car into the dealer. And on December 26th, the car started to go to the dealer! Well, it saved us money for towing. It turned out to be the starter, something my husband could have fixed, instead it was over $400 at the dealer. While the car was in the dealer and during all of this, shipments were getting delayed and I got word that my father was in the hospital and it was pretty bad. I should find a way there. Shipments were delayed and stress was mounting. The dealer remarked to my husband that the brakes were going to need work very soon and that we should plan on that or just get them done that day for an additional $1,200. He told them he would do them himself. We figured we had another month to get the parts and tools needed for that job. We were wrong. The brakes were quickly starting to fail and we had to consolidate shipping days. I didn’t get to the hospital at all. That’s ok. It will be alright. Dad will be fine and I will get up there in a day or two. By New Year’s Eve, the brakes failed completely. The car could not be driven at all. Both the front and rear brakes as well as the two rear wheel cylinders were out. And we JUST paid the car off. It was frigid in Michigan during this time, below zero with wind chills and in single digits without the help of the wind. We had blowing snow and no garage to shield the car or the man working on it who happened to be my husband. I didn’t get to the hospital at all. No shipments were going out. This process took days. And the days became longer and longer. There was little I could do to actually help. My husband literally walked a mile to the parts store to make sure he would get the right parts. You’re probably wondering why someone didn’t drive us, etc. In Michigan, during the winter, people really do not see each other much. If we needed to ask for a favor, it better be a big favor. From what my sister said, that favor was going to need to be a ride 60 miles to the hospital. My husband assured me that I would not need to ask anyone for that favor. Shipments were delayed. I can still feel the stress. I like to ship same to next day. I wanted to see my dad. I began to realize that I was very behind and put my eBay and Etsy stores on vacation, putting the reasons in the space provided for notes to customers. I also noted my situation on my Me Page at eBay and tweeted it for good measure. I wasn’t sure anyone would see anything. Orders still came in, God Bless them. Finally! On January 8th, 2010, we got to the hospital to see my dad, shipping just before going. My dad was far worse than I imagined. He couldn’t even look at me, speak or anything except an almost imperceptible hand squeeze. I held his hand the whole time I was there. I wasn’t sure we should leave, but my husband had been under a car in horrific weather conditions for days. We needed to rest. The stress had been exhausting, too. I never thought that would be the last time I would see my father alive. The next day, January 9th, 2010, my dad let go at 6:30 am. I had been planning to go see him later that day, but he was already gone. Everyone said he held on to see me. In this blur of emotion, this raw suffering, I still had to think about what to do with my business. I wasn’t sure what to do. I knew this would delay or further delay shipments and that I needed to address the public. I updated my vacation store status on eBay and Etsy, changed my Me Page and finally sent each person a copy and paste note about what was going on. It took a long time to write the note, but the copy and paste was therapeutic in some way. It was something I could manage in between helping with the funeral service and arrangements. Talking to my friends was especially helpful during this time. Kelly (not on Twitter 😉 reminded me what I would do in a situation like this – I would contact everyone, of course. @PowerSellingMom listened to me and advised me on the morning of the funeral. She calmed me down for 20 minutes, allowing me to go over my checklist of things I needed to do for the business. I am eternally grateful to Danna for that time. She also suggested I do this blog post. My father passed away yesterday after struggling through the holidays. Your prayers are greatly appreciated. All shipments are delayed. Please request a refund through eBay messaging if you cannot wait. Talk to you soon. Your patience is BEYOND appreciated. So far, no one has left me negative, neutral or nasty comment. My customers are truly the best. It is my hope this information will be useful to someone during a time when they find it difficult to think. It may sound strange that I would be so worried about my business during such personal tragedy, but there is not much separation between my personal and business life and I love it that way. 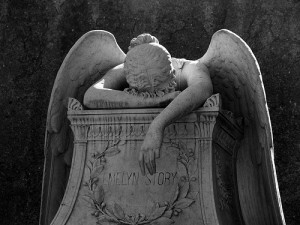 I am still grappling with the loss of my father and still get delayed a couple days here and there. I cannot predict when it will happen, but knowing my customers care for me like I care for them has kept me going. Grateful cannot begin to describe my feelings for you. Thank you so much for standing by me during this time. I have done a lot of writing about spam DMs or Direct Messages on Twitter recently and it may sound as if I don’t like to get DMs at all. Nothing could be further from the truth! I just adore DMs and prefer them to email, truth be told. Surprised? Don’t be! The DM is a private conversation. It is ideal for people who have very little time and/or short attention span with its limited character set. A big “up side” to having limited characters is that it can force someone to get to the point, be concise and stay focused. I used to write long, rambling emails. I used to enjoy reading them from others, too, but I simply do not have time for that luxury anymore. I spend most of my email time battling spam. It takes more time to sift email now and I do not enjoy sifting. It is my own fault since I should use a separate account for those purposes, but I digress. TweetVisor makes me so happy, I could sing! I always have TweetVisor up, so I can usually see DMs as they come in and reply instantly whenever I am online. TweetVisor shows everything all at once on one page, so I see my public @replies, too. This saves a TON of energy and effort, plus it allows me to be very speedy in my communications. Most of the time, an @reply on Twitter is great for both parties, lending exposure for both parties and the chance for new followers, but sometimes the conversation goes deeper or gets more involved or personal. How do I know when to take it to DM? When you send your email address or other private information, take it to DM. When you’re in an involved conversation and exchanged multiple messages that really concern no one else, take it to DM. When it would be impossible to follow or jump into the conversation, take it to DM. When the information you’d like to impart is very specifically for that one person, take it to DM. When the subject is private information, take it to DM. When you feel the need to use off-color language, in general, take it to DM. When contacting customer support or Twitter support about a sensitive subject or complaint, don’t be rude and embarrass the company in an @reply, take it to DM. Basically, an @reply or tweet is a shout out and a DM is a whisper. Whatever is said in DM is not general knowledge and should never be shared with someone else. You should never post the contents of a DM or tell someone else the contents of a DM. That is a trust violator that is not easily, if ever, overcome. Don’t overuse the DM, either, or your important messages may not be seen due to an onslaught of automatic DMs, frivolous flirtations and True Twit DM messages clogging the column. Master the art of the DM and it will simplify many areas of your electronic life! Keyless Entry is the Way to Go! Time to do home winterizing! With the economy in dire straits, it’s a good idea to beef up security on your home for the winter, too. And in my case, we could no longer afford our homeowner’s insurance, so we really needed a better deadbolt. Locks have one flaw as pointed out in an episode of “Seinfeld” the door must be closed! Once the door is closed, there is the issue of “who has the key?” Not anymore! No juggling or struggling to fit the key in the lock with your arms filled with groceries or our dogs pulling. Now remembering a simple pin number will let you into your home! No one can “guess” your number because the unique numbers are provided with the lock. There are no dots to connect or codes to crack. The lock comes in a variety of colors. Ours is "Aged Bronze", very dark. Maybe the lock looks complicated to you? It did to me. I thought I better have my husband install it and set it up. But installation was super easy and only took about a half hour. I thought we needed to program it – NOPE! So we did have to take it back apart to reset the unit. That was a whopping 3 minutes that could have been avoided by paying attention. Schlage truly made this the easiest way for a homeowner to secure his/her home with the latest and most up to date technology. 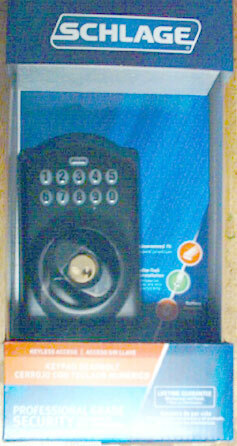 Keyless entry for a home is new to me, so it comforts me to have a key override in case anything should ever go wrong. Keyless entry brings our home into the 21st Century and raises the value a little, if you ask me. The locks are beautiful! Check out the assortment! It is very dark on my street, too, so the vibrant violet color that illuminates the keypad is a godsend at night! If your home is worth $100,000 or more, shouldn’t you take extra care in choosing a lock to secure it? What about the safety of your family? The actual deadbolt part of the lock is longer than average, so no one can pry it open with a butter knife. The Schlage keyless entry system resembles a security alarm system and that doesn’t hurt when criminals profile neighborhoods. We have probably all seen the stickers for alarm systems in the windows of our neighbors. I live in the metro Detroit area, so I know a thing or two about avoiding crime. 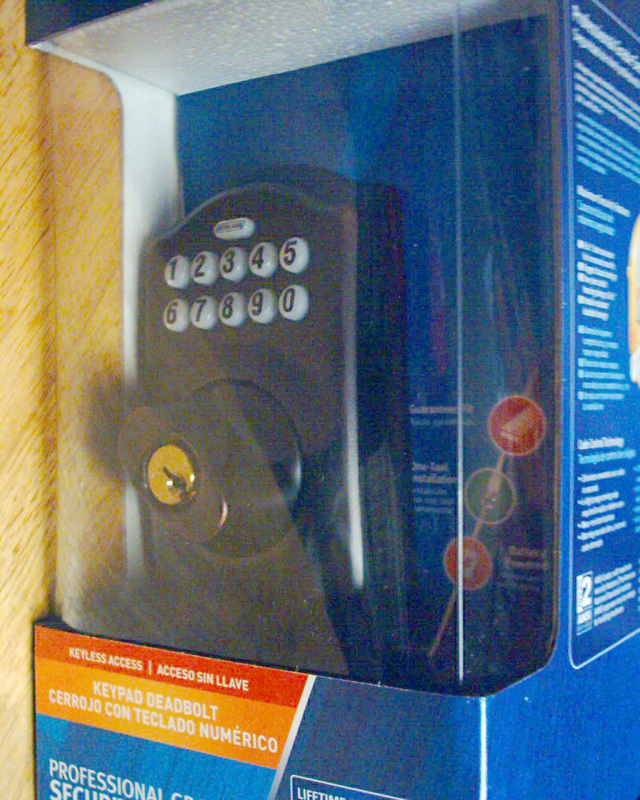 Note, my husband, David, is a licensed, registered Locksmith and Residential Builder who really loves this lock. Disclosure: Schlage supplied this product free of charge, but I was NOT obligated to blog about it. And we were NOT obligated to love it – but we do!